It's especially important to consider safety before using a kayak, canoe or a similar unpowered vessel. These craft sit quite low in the water and are susceptible to risks such as capsizing, blowing off course, taking on water and reduced visibility to other vessels. Before operating unpowered vessels of any kind you should always check safety equipment and stock it with other necessary provisions such as water, snacks, sunscreen, etc depending on the area of operation and anticipated period of your trip. As the paddler of your craft you are responsible for your safety and the safety of any other people on the vessel. The information below will help you stay safe. 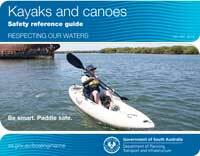 It is taken from the Kayaks and canoes safety reference guide (1.2 MB PDF). Information for motorised boats can provide helpful hints that may apply to you being safe on your vessel. Check the weather and tide information with the Bureau of Meteorology or call 8366 2600 for further information before you go out and be prepared to cancel your trip if necessary. Ensure your vessel is suitable for your intended area of operation. Vessels designed for use on inland or sheltered waters are not usually suited to open waters or along the coast, where waves are larger. Sea going vessels may be just as suitable for use in a river or lake. Check your vessel for leaks and damage and general seaworthiness before each trip to make sure it's seaworthy. Wear the correct life jacket for the location where you are paddling. If travelling solo, be attentive and keep a proper lookout; be aware of hazards and changing conditions. Always carry a means of communication. Attach reflective tape to the vessel and paddles to increase visibility. Keep a buoyant, waterproof torch in your safety kit - this is essential when travelling between the hours of sunset and sunrise. Travel in a group where possible to maximise safety. Wear brightly coloured clothing to ensure you are visible to other water users and make sure your clothing is appropriate for the conditions and location where you are paddling. Make sure your skills and fitness level are adequate for the area and the conditions where you are paddling. Read the information on abandoning the boat, and know what to do,should you have an accident where your kayak or canoe is damaged or you capsize and cannot get back into the vessel. Safety equipment requirements apply to kayaks and canoes and it is important that you are carrying suitable safety equipment for your area of operation. A correctly fitted life jacket must be worn by each person on the vessel. Information on types of life jackets and other safety equipment is available on marine safety equipment web page. The International boating rules apply to kayak and canoe paddlers. All operators of vessels need to be aware of the risks associated with different types of vessels using the water at the same time and safe boating near commercial vessels. It is an offence to operate a vessel (powered or unpowered) and to have a blood alcohol concentration of .05 or more or to be under the influence of drugs. Know the rules that apply to alcohol, drugs and boating. Hypothermia is the effect of heat loss from the body and immersion in cold water causes the body to lose heat up to 25 times faster than normal. Paddlers have a greater exposure to the elements and boating in cooler weather increases the risk of developing hypothermia from wind-chill, capsizing or damp and wet clothes. Sudden immersion in cold water can be life threatening especially to people who are older, unfit or under stress from being in the water. If your vessel is involved in an incident or you witness an incident you have a legal obligation to stop and provide assistance. Where additional assistance is required and you have a mobile phone with you, dial 000 to alert the appropriate authority. If you are involved in an accident that results in death, or injury requiring medical attention to any person, or damage to property exceeding $300, you must report the matter to a police officer nearest the place of the accident/incident or a Marine Safety Officer on 8260 0220 within 48 hours of the accident or incident. A vessel accident report (319.1 KB PDF) can be downloaded and more information is available about reporting boat incidents. If you observe or experience careless or dangerous operation of a vessel you can report the matter to the Department of Planning, Transport and Infrastructure (DPTI) Marine Operations on 8260 0220 or email the Boating Safety Unit. Make a note of any identifying numbers or other useful information. Overloading your craft seriously reduces stability making your vessel more likely to capsize. Follow the manufacturer's guide for the recommended weight capacity and the number of people your vessel is designed for and stow all items securely. Sea kayaking is a complex activity in a demanding environment. We strongly suggest that you take instruction from qualified instructors, and that you always paddle as a group. Kayakers, canoeists and people using any kind of unpowered vessel are advised to remain with their craft if they capsize so they can be seen more easily by search crews. Any vessel fitted with any type of engine or motor must be registered, the operator hold a boat operator's licence, registration number displayed and appropriate safety equipment carried. Exemptions from registration, boat licence and carriage of specified safety equipment apply for kayaks or canoes fitted with an electric motor of not more than 150 newtons (33.7 lb thrust) when operated by a person of 16 years of age or older. the power source for the electric motor is a marine grade closed cell 12 volt battery. the vessel must operate in semi protected or protected waters only. Safety equipment and life jacket requirements for kayaks or canoes apply regardless of the fitting of a motor. Note: some motor manufacturers badge the 150 newtons motor as 34 lb thrust which is accepted as meeting the maximum of 33.7 lb thrust criteria. Further information is available from DPTI, Boating Safety Unit, by telephoning 1300 183 046 or by e-mail to dpti.recreationalboatingunit@sa.gov.au.